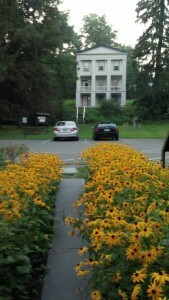 Just back from presenting a 2-day workshop at the lovely Peters Valley Craft Center in Layton, NJ. Great people at Peters Valley and in the class. Pretty country location: I saw deer, bunnies, wild turkey, and a heron. They have a big anagama firing coming up next. Thanks to everyone who came to the workshop and gave such good energy, and thanks to the nice people at Peters Valley. Before I left I got a few cups out of the kiln from a decal firing. 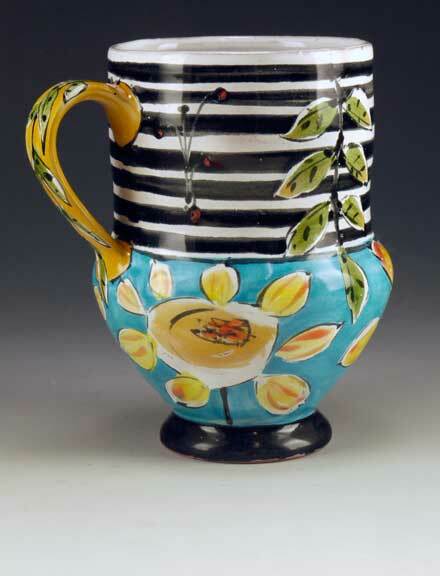 Lindsay Rogers is curating a cup show at Crimson Laurel Gallery for later this fall, and chose a theme of water. Initially, I was a bit flummoxed about what to do for the show… water? One of my early pottery teachers said you are destined to make pots like your body shape. In reaction to that, my studio life has been a quest to make rising volumes that lift in response to gravity. For the water show, it seemed right to make a cup with a low, drop-shaped volume. 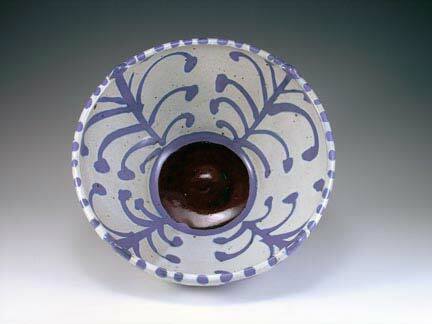 In 2008 I had the opportunity to go back to Jingdezhen, China, for an NCECA symposium on ceramic education. Jingdezhen is the home of porcelain, with over 1000 years of continuous porcelain production. Ceramics is a major occupation in the city, and you see it everywhere. They make both screen-printed underglaze and overglaze decals there. I fell in love with the overglaze orange carp decals and the pink-and-green lotus image and brought several sheets home, waiting for a good excuse to use them. This seemed the place. Not only do lotus grow in water, but the story of the lotus-eaters is about forgetting. There is a huge local flap here about a permit for a mammoth cattle facility and slaughter-house in FL that will pump 13 million gallons of water per day from the Florida aquifer. One of the local paper articles here. So, I think in some ways we are all lotus-eaters about the way resources are consumed. Looking forward to finishing up a few more water cups in this shape. 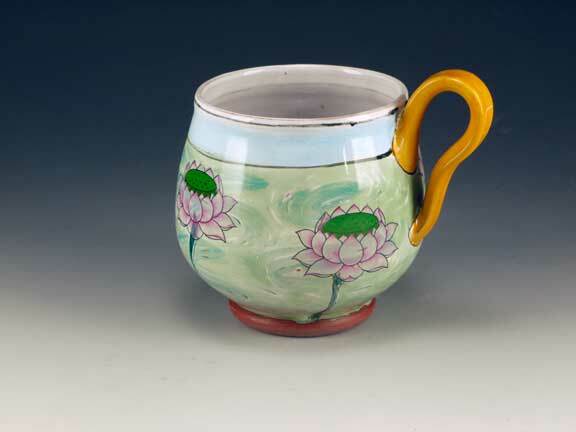 Below, cup in terracotta with majolica glaze and Chinese lotus overglaze decals. If you’re interested in exploring the Chinese overglaze and underglaze decals, Chinese Clay Art has them for sale online inexpensively. Busy morning getting some work shot, invoiced, packed up and off to The Art of the Cup: Functional Comfort. The show will run from Sept. 6th – Dec. 10th at the Ogden Museum at University of New Orleans. NOLA is always a good audience for beauty and comfort, and I’m pleased to be showing up there. I knew I had to ship today, but discovered to my horror at 7 a.m. that they also wanted high-res images as well. Uh oh. Glad I could shoot at home and didn’t have to deal with getting a photographer. On my web site is a link to info about my photo setup. In undergrad school I minored in textiles loved to screen print fabrics until I had hand problems. As a practical fall-back, I decided photo would help me in any art career, and took less manual work than squeegie-ing ink on yardage. Those were the days of black-and-white film and silver prints in the darkroom, where a good day printing (like any deep studio experience) stopped all sense of time. Gainesville artist Jerry Uelsmann, international photo rock-star and UF Professor Emeritus, still prints his surreal images with silver process and multiple enlargers in a darkroom.Part of me misses the physicality of making b&w prints, but much of me is happy I can do quick digital documentation of my work at home. It’s within the grasp of most artists to learn to shoot serviceable images of their own work. Certainly, a professional photographer can really make glamor shots with great lighting happen, but many of us can’t afford the money or time to hire a professional. In the early days of digital photo, talk on the street was that it was a fun novelty, but would NEVER rival the quality of film. A lot of progress has been made. One of the advantages is that you can try any shot at no cost in materials, and take it to your computer right away to see how that lighting and those settings worked out for you. There are free photo programs available online. I can’t say I’ve used them (I use an older version of Adobe Creative Suite), but have read that the free Picasa and GIMP are popular. Adobe’s lower-end Photoshop Elements program is another budget solution to working with images. For very basic things, there are some tools in Microsoft Office’s Picture Manager. In Office 2007, it’s in the TOOLS folder of the program menu. Basic image management probably includes adjusting any errors in color and contrast, cropping where needed, manipulating image size, and converting file format where needed. There’s a lot online to help people getting started with these mysteries. For the images below, the camera saw the fluorescent photo flood light as more yellow than my eyes, and I had to adjust the color a bit to look true. One of the images was a bit crooked and I had to rotate it a bit to look straight. The images were taken as RAW (uncompressed data) for any future high-end print use, and large jpg for current digital and casual print use. For web use or e-mail, images need to be made small. Please don’t send people print-sized images by e-mail. If you live in a rural location, as I do, with s-l-o-w internet, it takes nearly forever to download a huge file. Anyone receiving mail via a paid data plan, like on a smartphone, will not want to pay to look at your huge images. Printers would like 300+ pixels per inch and need a big file to make a lovely print. Many cameras are set by default to take images at print resolution, as you can downsize images for other uses, but not up-size a small image for bigger use (they get pixellated and fuzzy if you do that.) Digital screens only render 72 pixels per inch – ppi. All the rest of your 5 meg digital image is just wasted space and time if it’s just for digital only use. The original jpg images for those below are about 2.4 megs – that’s 2400 kb. The camera I use (Lumix G1) shoots at a high setting at 180 ppi, but a huge image: 21 x 15 inches. That means at 300 ppi, I can print a very nice image in the neighborhood of 10 x 8. The images below are re-sized in Photoshop for tidy digital use: 72 ppi, 10″ H x 7.5 or so W, and saved in Photoshop under the FILE menu, SAVE FORE WEB AND DEVICES, which compresses the file into a small size. Saved in that as a medium-quality jpg it’s about 30 kb of data (vs. 2400 kb+ in the original.) Still a large, crisp image on screen, but a polite, small file size. Below, images of the cups I sent off to the upcoming Ogden show. I did send them the big files by e-mail, as they requested high-res images that they could use for print media, or make smaller for digital. Linda Arbuckle. 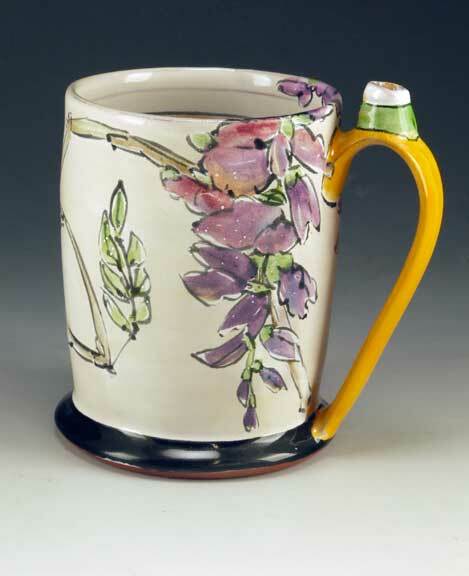 Tankard with Wisteria. Majolica on terracotta. 2012. Somone just asked me about a spar substitution. My experience is that for many applications, spar substitutions within the categories of soda spars or pot (potassium) spars have some leeway and will often endure substitutions fairly easily. Unless they don’t. The “pot” or “soda” spar refers to the dominant flux in the feldspar. I suggest testing, and I’d test the easiest fix first – substitute a spar you have, and see if it changes things in an unacceptable way. If it does, try the things suggested below. At home I’m still slogging through my big bucket of old majolica glaze. At workshops, I’ve had people use various substitutions, and other than some alternate soda spars deflocculating the raw glaze, it’s been fine. 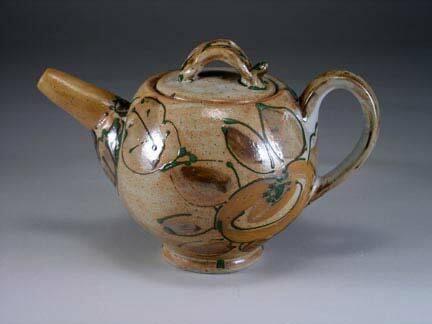 If you need to review floc/deflocc, see the Ceramic Arts Daily video demo on this. In the idealized (simplified) feldspar formula above, KNaO refers to any combination of sodium or potassium. K2O is potassium oxide – 2 potassium for every oxygen. Ditto Na2O. So KNaO maintains the 2 units of flux for every oxygen, but is shorthand for “any combination of” because they often operate interchangably and it’s easier to calculate if you overlook the distinction because if often doesn’t matter. An actual feldspar, say F4, will have traces of other oxides in it, and not be quite that simple. These small inclusions are often overlooked in calculation of glazes because they often are insignificant. Since sodium and potassium have different atomic weights, the weights of soda spar and pot spar differ in idealized form. If you plug in two K instead of KNaO, the weight is 556 units vs. 524 for sodium. So, you might get a weight difference if you jump pot vs. soda categories. It would be conservative to stay within K or Na family of the spar you’re substituting. Wikipedia on feldspar. Image from Wikipedia. Info below thanks to NM Clay in 2010. If you go to Brant’s blog post below, you can download the datasheets for the spars. Soda Feldspar – Kona F4 There is a supply change in the Soda Feldspar Kona F4. It is not available from the mine any longer due to a fire and mine closure. We will have Minspar 200 available. They are both very close to the F4 in composition. 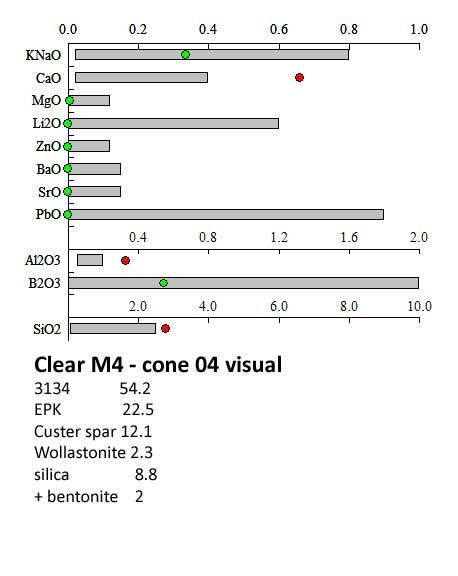 A chemical analysis of the materials is below. Minspar 200 was Formerly NC-4 Feldspar. “G-200 felspar, mined by Imerys North America Ceramics, has been discontinued. While there are still stocks in potters’ studios and ceramics supply bins it will eventually join Albany Slip, Gerstley borate, Kingman felspar, Oxford felspar, and other materials that have gone out of production. 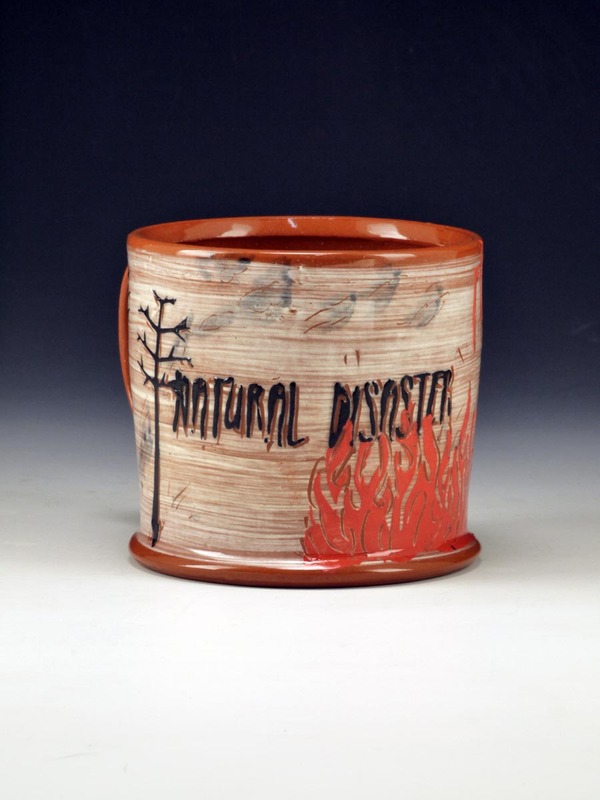 G-200’s demise is based on economic considerations that potters do not control. Originally, G-200, as potters know it, was blended at the processing plant by using 70% Minspar 200, a sodium based felspar, and 30% HP G-200, a potassium based felspar. The blended felspars then became G-200 and were shipped throughout the United States. Thank you Mr. Zamek I couldn’t have said it better or at all! Laguna Clay will be blending G-200 so it will be available. G-200HP is the new product and according to Jon Pacini from Laguna the major difference is slightly more fluxing power, similar to (the also defunct) Kingman Feldspar of old. Posted by Brant from New Mexico Clay Inc on his blog. Clean Creek Products is a company that markets materials reclaimed from coal mining. They’ve had a booth at NCECA to showcase their iron and manganese. There is a show coming up that features these materials, and I’ve been working with their iron and manganese to try to get something pretty in a glaze. On top of most non-lead majolica glazes, iron is just so very brown. Not amber-golden, not rich rust, but just brown. I rarely use brown in my majolica color palette, so I thought I’d take this as a nudge to do some fun slip work with paper stencils and look for glazes to go over that that are rust or golden. UF has some clear glazes for 04 use – Deb’s Clear and (Ron) Meyers Clear. Both have issues. The Meyers Clear is the main one. If it gets thick, you get evil small craters that won’t heal, and just get worse if re-fired. I think it’s too viscous. 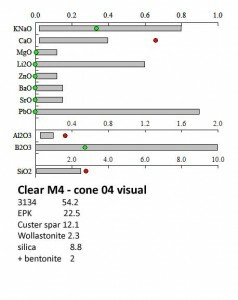 The alumina is high, in addition to having boron. 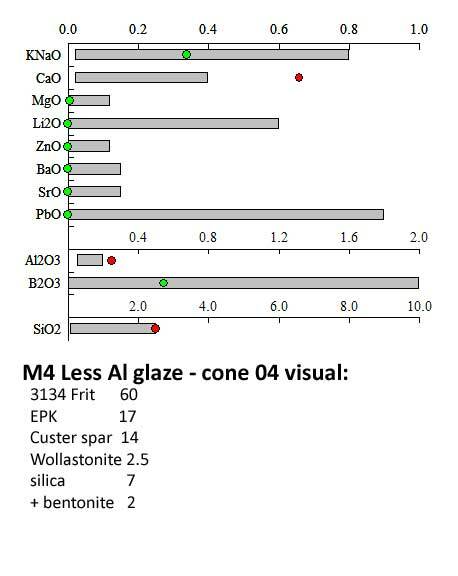 I’ve tested some similar formulas with lower alumina. The raw Meyers is also very high in frit. 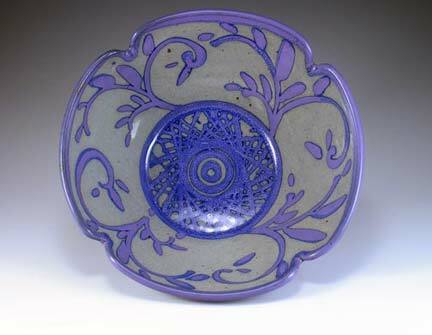 In addition to cost, high-frit glazes have to be applied unusually thinly for a good result – hard for beginners to judge. EPK 10.2 plus 2 Bentonite. When I look at the glaze under a 30x little microscope (Radio Shack has some that are cheap – $9.00 last I bought one), the glaze is filled with trapped bubbles. The up side is that it doesn’t run or even move, but it also in unforgiving about being too thick, and it’s very easy to get it that way. My new version with less alumina and a bit more KNaO, and a test even less Al. Results were counterintuitive. 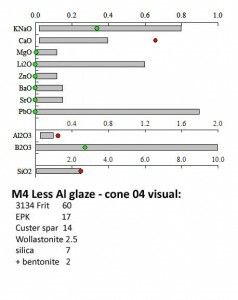 The Less Alumina version of M4 has MORE bubbles that causes milkiness thick. Hmmm. 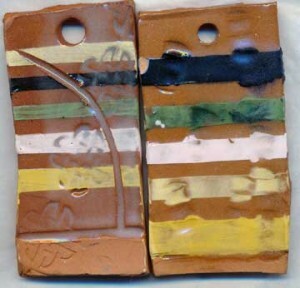 Difference in clay color may be from different batches of test tiles. Using up old stuff. Slip colors very similar. Somehow, the bucket labeled WHITE SLIP is coming out pale yellow. Need to re-mix. Out of touch w/studio during the school year. Nice to get back to daily contact. M4 bleeds the black slip ever so slightly when thick. Maybe I can live w/that. I know just enough about glaze materials to know I don’t know enough. The M4 version looks better than the original Meyers Clear to me, but it will take testing on real thiings to see how it works. For some time I’ve been enjoying the blogs of other people and thinking I should set one up to share various things. Time is always the question, but summer is a good time for me to begin. I’ve just gotten a new Skutt Glaze Tech test kiln, and have been working on some iron and manganese glaze tests, trying for something more than plain brown. Check back in a few days for some test tile scans. Expect some changes in format as I learn to use WordPress. Dreamhost, my web host, provides a one-click install, and I’ve taken the plunge, but I’m clueless about WordPress and doing some tutorials.